What a disaster this morning! Instead of waking up early and getting to ABC before mid morning, I didn’t hear the alarm clock and Julian and I were still asleep at 7:45. That was good because it had taken me ages to go to sleep last night – the zip on my sleeping bag which I rented from a Pokhara lowlife is broken and so obviously makes the nights even colder. Again we were the last out of our lodge apart from 2 young Japanese men. I had a chat with them and one is from a city not far from Fuji City. The path today was a gentle uphill trudge. There are no trees or bushes now just boggy grass and heather-like vegetation. Looking behind us we had a glorious view of Machhapuchhre (the fishtail mountain) and at one point the sun appeared around the southern side of it. Thanks to Julian pointing this out to me, I managed to get it all on film. Ahead of us was Annapurna South and we also had glimpses of Annapurna III behind the smaller hills in the foreground. Julian found a pond that had frozen over and took great delight in breaking the ice. 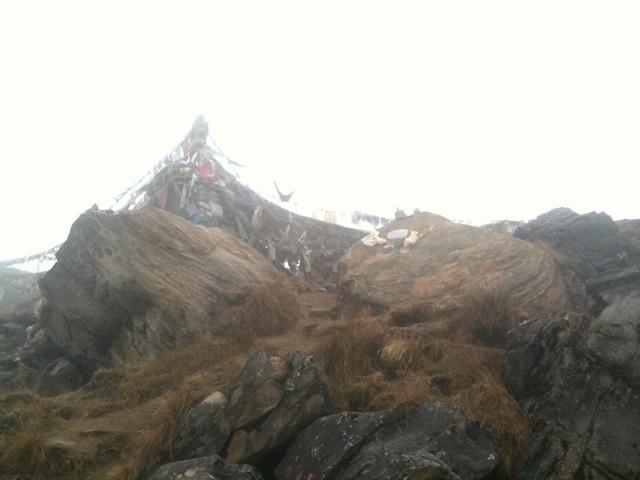 Many people were coming down from the base camp. Some of them we recognised from previous days and conversations. Before long Peter and his guide came down and we had a good 2 minute re-union. He said the sunrise this day had been good and they had had excellent views of the mountains. All the people coming down were smiling and in a good mood – it was like they were all on happy gas. 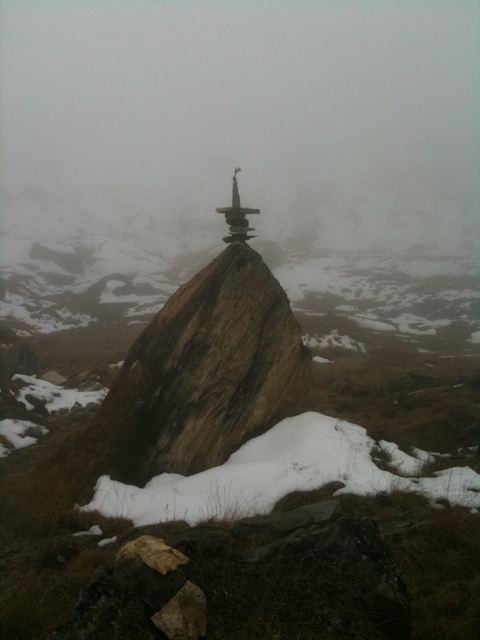 The clouds started to follow us up the mountain and soon Machhapuchhre was invisible to us. There were a few black birds flying through the mist and the scene was becoming quite eerie. Narayan was ahead of us and most of the time and it was quiet all round. By the time we reached the sign saying “Welcome to Annapurna Base Camp” the place was completely in cloud and we could barely see 50m ahead let alone the mountains. We had an early lunch and met again the four elderly Japanese people; 3 men and a woman. They made a big fuss of Julian and he opened up a bit to them. Then I put Julian to bed. It was only about 1pm but he was getting a bit quiet and I don’t think he slept too well last night. While he slept I walked further up towards the mountains. It was totally silent and still cloudy. There were small cairns of 6 or 7 rocks on top of each other which people had piled up but my eye was caught by a group of payer flags which draped a much larger permanent cairn. 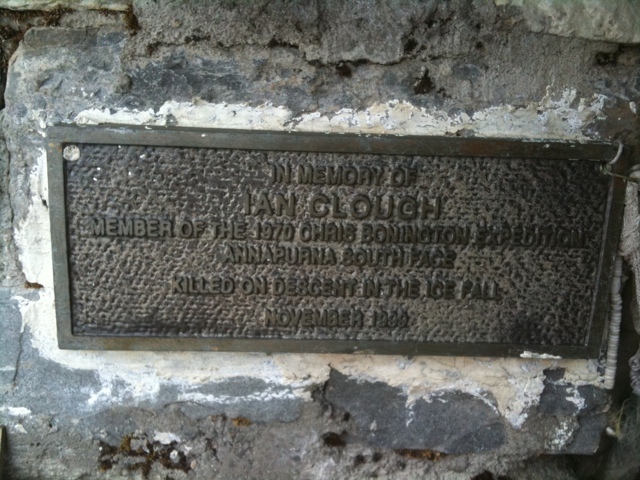 On this I found the memorial plaque for Ian Clough who was killed in the 1970 on the final day of Chris Bonington’s Annapurna South expedition. 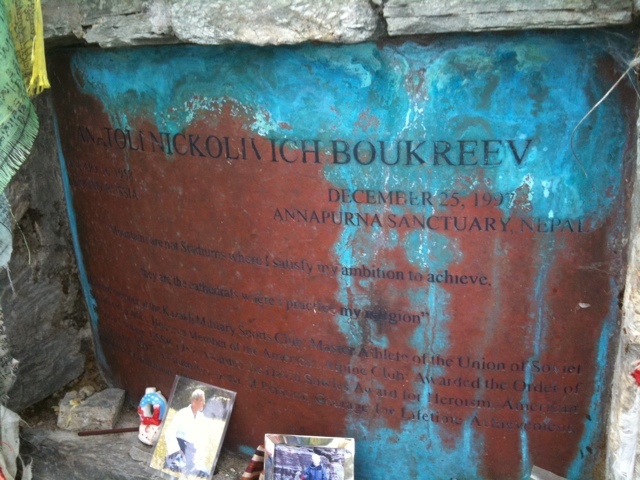 There was also a plaque for Anantoli Boukreev, the Russian mountaineer who saved some people’s lives during the 1996 Everest disaster. Both these men were killed by avalanches on Annapurna. If the weather is good tomorrow, the views should be spectacular.